Hello, internets! It’s #TravelTuesday again, so I’m here to impart some kind of wisdom onto you, and today it’s all about tweaking colour with Camera Raw’s Hue sliders. But first! I’m writing this post from a Starbucks just outside of the Loch Lomond and The Trossachs National Park in Scotland, fresh from an overnight stop before I head farther north towards the Isle of Skye. I’m shooting a couple of little projects involving drone photography and Platypod tripods. You can keep up with what I’m doing on this trip by following me on social media (look for @capturewithdave) and by watching the @kelbyonepics Instagram story! The HSL (Hue/Saturation/Luminance) Adjustments panel in Adobe Camera Raw is very useful, but perhaps most confusing are the Hue options. While the Saturation and Luminance sliders enhance the colours, the Hue sliders actually change them. There are some pretty powerful things you can do with the Hue sliders—you can even change the seasons in post if you tweak the colours the right way. What’s actually happening when you adjust a colour slider in the Hue tab is that you’re moving its position on a colour wheel. In terms of its practical application, I’ll use the Hue sliders to adjust this photo and make the grass greener, whilst maintaining the other colours. In this shot, the tones up in the sky are beautiful—the sun lowering in the sky (it’s 9pm) is casting a fabulous orange glow—but I feel like the grass should be just a little bit greener. We can take advantage of the Hue sliders and make this adjustment easily right in Camera Raw. Using the Hue sliders to shift the colours within sections of the colour wheel, if we move the Yellows slider (the colour of the grass in this case) towards the green end, and compensate with the Oranges and Greens sliders to maintain the actual green and retain that orange in the sky by moving those sliders away from the yellow ends, we’ve easily achieved our goal! It’s as easy as that! That grass is now greener, which to me is more realistic and more pleasing, and all it took was an understanding of what’s going on with the Hue tab’s sliders. Straightening a shot is something that is one of the absolute fundamentals of photography post-processing, yet it’s commonly overlooked. Those of you who catch The Grid every Wednesday with Scott will no doubt be aware that it commonly pops up whenever blind photo critiques are the theme of the show. To that end, my post for this week’s #HybridDaveTuesdays is about two correction techniques you can use in Adobe Camera Raw before you hop over to Photoshop. 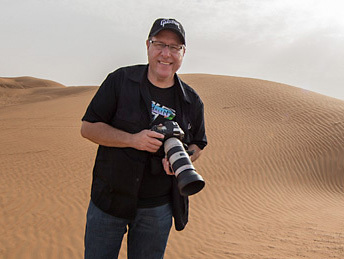 I’m Dave Williams, a travel photographer from London, UK, and you can catch my weekly posts right here at ScottKelby.com every #TravelTuesday—feel free to drop me a message on Instagram where I’m @Hybriddave. Let’s look at using Camera Raw to straighten. The reason Camera Raw is my default choice for straightening is its ease, its accuracy, and its varied applications of the Straighten tool. Just last week, I was in Portugal with Scott, so it seems appropriate to use one of my crooked photos from the trip, hosted by Chicki Nando, as the example. Monserrate Palace near Sintra, Portugal. As you can see, this shot is crooked. I’ve overlaid a grid to show that the horizon isn’t straight, and it’s having a detrimental effect on the shot because the building looks as if it’s leaning. The simplest method to correct this in Camera Raw is to hit the A key on your keyboard to access the Straighten tool. Double-click on your image. This sets the Straighten tool’s automatic process off, and the horizon will be found automatically, and your image straightened to match. This works 99.9% of the time (no scientists were consulted in order to reach this figure, but I’m probably not far off). The Straighten tool changes your cursor to a kind of spirit level thing. Use this to draw on the horizon yourself, or any other horizontal line in the absence of a horizon, and the image will rotate slightly to set this as the horizon line. Hit Return (PC: Enter), and your shot will straighten. That’s it! Your crooked image is now straight! If you have a straight photo, people ignore the fact that it’s straight and enjoy the other elements of it. If you have a crooked photo, people ignore the other elements of it and focus on the fact that it’s crooked. Still Monserrate Palace, still near Sintra, Portugal, but straight! So, for this week, I thank you for dropping by.